German Aerospace Center (DLR), presented a biofuel project planned by Lufthansa. programme aimed at underpinning the sustainability of air traffic. system. That backing is afforded within internationally comparable framework conditions. Lufthansa is currently making intensive preparations for the practical tests. Wolfgang Mayrhuber. “Our fuel is sustainable. No rain forest will be deforested for Lufthansa biofuel. its biofuel is expected in March 2011.
operational measures such as engine washing and infrastructural improvements. now down to 4.3 litres of kerosene over 100 kilometres. Lufthansa will use NExBTL renewable jet fuel produced by Finland’s Neste Oil. palm oil, rapeseed oil and animal fat. Neste says it is also looking at other feedstocks such as jatropha. biofuel blend produced by camelina, again using UOP’s hydrotreatment process. Fischer-Tropsch process. The bio-SPKs may be next, by March 2011. Posted: Tuesday, November 30th, 2010. Filed in Biofuels News. using the airline’s fleet of brand new Embraer 190 aircraft. French ski destination back to London on Mondays, Tuesdays, Saturdays and Sundays. or even longer, skiing on some of the world’s best slopes and resorts. and snowboarders of all abilities. car, the family run two-star L’Hotel Athena or the modern two-star La Vanoise. The three-star L’Oree des Pistes in Les Deux Alpes is ideal for ski breaks. assisting the hard press folk of the City to get to their vital business destinations. and 14 minutes to Poplar (connecting to Canary Wharf). use with faster check-in times than any other London airport. timber and polished limestone floors; marble surfaces and leather seating throughout. departure lounge with numerous laptop plug-in points and complimentary Wi-Fi access. or Palma, as well as Chambery? Posted: Monday, November 29th, 2010. Filed in News about Airports. now airport operator BAA has said work will begin in March. It is expected to finish in the summer of 2012.
whole of the north east. the quality of life in the region. Groups including Aberdeen Against Climate Change had objected to the plans. disruption at the airport in March last year. killing at least 12 people. 31 tonnes of relief aid to Khartoum in Sudan. and at least four people on the ground. on impact with the ground, setting ablaze and destroying several buildings. aircraft very quickly," said local resident Riaz Ahmed. Seven of the freighter’s crew were Ukrainians and one was a Russian. Reports suggest the operator of the plane was Sun Way Airlines, but as IFW went to press, it was unclear where the company was based. killing all 21 people onboard. near the capital city of Islamabad. said Pervez George, the Civil Aviation Authority (CAA) spokesman. pulled out two more dead bodies, bringing the death toll to ten. cause of the crash was not immediately available. near the airport. All 21 people on board were killed. Posted: Monday, November 29th, 2010. Filed in Air Freight News. kerosene using an Airbus A321. fuels produced from vegetable oil or animal fat via a hydrotreatment process. produced from coal, natural gas or biomass using the Fischer-Tropsch process. – ASTM D7566. F-T SPKs [ Fischer-Tropsch synthetic paraffinic kerosenes ] formed the first annexe; bio-SPKs will be next. engine testing, to provide additional data ahead of next week’s vote. fuel is announced to be used on normal scheduled flights. Society for Testing and Materials ( http://www.astm.org ) allowing the use of jet fuel produced using Neste Oil’s NExBTL technology. This is expected to take place in spring 2011.
as a number of universities. in one engine, while the other engine will use conventional jet fuel. jet fuel meets all these requirements. will not be covered by a biofuel mandate, however. people, and is listed on NASDAQ OMX Helsinki. & gas sector. Further information: www.nesteoil.com. those of fossil-based jet fuel. contains a minimum of 10% renewable content. cooperation with leading automotive manufacturers. becoming the first commercial supplier of aviation agrofuels. Posted: Monday, November 29th, 2010. Filed in Biofuels News. out a loan, The Journal can reveal. Bank of Scotland in 2006.
a percentage of the loan amount as a bonus. Mr Friis was to receive 1%. people – but the decision was not made public. directors, who no longer work for the airport. it refinances again in 2013.
part of the region’s economic infrastructure, and half owned by council tax payers. "So it has to be managed transparently and in the interests of the whole region. Posted: Sunday, November 28th, 2010. Filed in News about Airports. over 50% for each departing domestic passenger. and immigration channels, as those travellers flying outside of UK borders. against domestic operations from London Heathrow. serving the domestic and Northern Ireland markets. would damage the economic links between Heathrow and key regions across the UK. Ireland to outline the damage that BAA’s higher charges would do to the economy. level and from the business community." been attacked by two of Britain’s leading airlines. of changes announced by BAA, the company that owns seven principal airports. in the number of services available to domestic travellers. and said it would consider taking legal action against BAA. Britons to travel by train for all domestic journeys – an idea dismissed by Mr Prock-Schauer. are unlikely to be any better off. 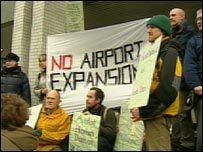 BAA said it had no plans to extend the changes to its other airports. Posted: Saturday, November 27th, 2010. Filed in General News. to Transport Secretary Philip Hammond, it emerged today. option to be included in the Government’s first aviation review. growing UK market of 230 million passengers a year. demand for air travel," he said. replacing Heathrow, on an island in the Thames Estuary. on bird populations and special protected areas of habitat. 27.10.2010 More …..
Posted: Friday, November 26th, 2010. Filed in News about Airports. financing were less available to airlines. of aircraft deliveries and the price of export credit financing raised. finance aircraft without the help of export credit. It is not clear if the home market rule will be scrapped. to defuse an international dispute on the issue. export support on the companies’ planes. Airbus is a unit of European Aeronautic Defence & Space Co.
Twenty-four airlines from the home countriesâ€”the U.S., France, Germany, the U.K.
financing, while some want it limited for all airlines from developed countries. officials declined to comment on the status of the yearlong negotiations. this year, although some officials have said the talks could slip into next year. more expensive than funding backed by U.S. and European government guarantees. Pegasus of Turkey, Virgin Blue from Australia and Wizz Air from Hungary. hurts them and costs airline jobs. wish to buy Airbus should have access to export credit,” he said. group’s proposal before making a comment. Posted: Friday, November 26th, 2010. Filed in General News. warming the surface of the Earth and causing climate change. Jeremiah Lengoasa told a briefing. 29 to December 10 to discuss climate change. in 2009 and rose by 27.5% from 1990 to 2009, the WMO said. but this had only a marginal impact on the long-lasting concentrations. deforestation and changes in land use, the WMO said. becoming more significant, it said. of methane into the atmosphere which then contribute to further global warming. in October 2009 and up from 382.98 in October 2008.
emissions of methane from Arctic areas. the rising atmospheric burdens of carbon dioxide, methane and nitrous oxide. is of great concern and is becoming a focus of intensive research and observations." surface of the Earth and negative forcing tends to cool it. it has increased by an average annual 1.88%, according to WMO. most important greenhouse gas after carbon dioxide. the remaining 40% being from natural sources such as wetlands. increases are not yet fully understood. nitrous oxide in 2009 was 19% higher, at 322.5 parts per billion than the pre-industrial era. much longer in the atmosphere than carbon dioxide. for Greenhouse Gases, hosted by the Japan Meteorological Agency (JMA). The 2009 Greenhouse Gas Bulletin is the sixth in the series, which began in 2004.
on the latest changes and atmospheric burdens of the main greenhouse gases. Posted: Friday, November 26th, 2010. Filed in Climate Change News.